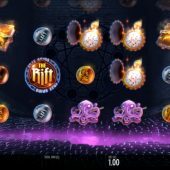 The Rift slot instantly impressed me upon opening with the eye-catching graphics and design and then the animations when I hit the spin button. The reels are transparent and are set over a wall on the corner of a deserted cobblestone street at night, lit through a mist and would surely make a great backdrop for a Jack the Ripper movie. There is a dramatic and sinister music composition as we play too, and this is indicated by the mysterious Nonagram etched into the wall behind the reels which will burst into life later on. Can you escape these dark and brooding streets with your bankroll though? There are 5 of them with 3 rows each and a rather odd 17 paying lines, although Thunderkick have kind of made this a trademark quirk having also had Babushkas and Bird on A Wire with this amount of pay lines. The symbols are mainly of the Victorian era, a Locked Book being the top pay at 30x bet. The others are a Pocket Watch at 17x, Octupus Brooch at 12x, Scent Bottle at 10x with 4 different colours of coin paying 6, 5 4 and 3x bet respectively for the full line. The symbols aren't fully stacked but do appear 2 rows high in some cases or you can land one on the top and bottom rows split by a different one. The Wilds appear on all reels and pay the same as the top pay, 30x bet for a full line. Now The Rift has a feature I have always appreciated, a 'taster' for the bonus when you only get 2 of the 3 scatters necessary. So if 2 Rift Logos appear, you will get a re-spin with any Wild(s) that were on the reels by chance frozen, and then either 2 or 3 extra Wilds will be added decided by what is shown on the Nonagram behind the reels which will have lit up either 6 or all 9 of its points. The reels stop and then wins are paid. As above but this time 3, 4 or 5 Rift Logos will trigger 10, 15 or 20 free games. This time the Nonagram is blank and the spins commence. 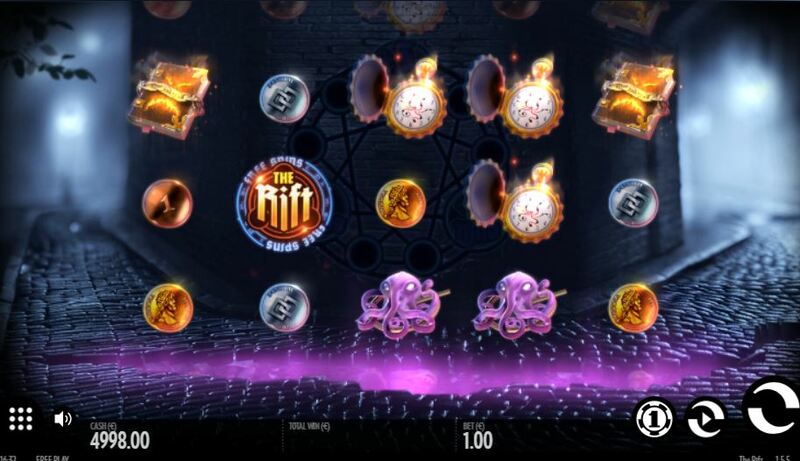 Every Rift appearing will illuminate one of the nine points, with every third one offering a prize. The third point will award a single Wild to be randomly added on each remaining spin plus two extra spins, the sixth point will increase that to 2 extra Wilds per spin plus 2 extra spins and finally if you light all 9 positions up your remaining games will all have 3 Wilds added plus you get another 2 spins. There is one other enhancement in the free games - any Wilds appearing which aren't used in a winning combo remain until they actually are used.